We have two Holiday 2011 contests to draw the winners for today. These are just the first of many. Let's see who the lucky readers are! Out of 521 entries, the winner of the Hearts For Hearts Girls Doll contest is . . .
Out of 132 entries, the winner of The Gallery Collection greeting cards contest is . 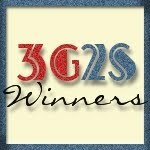 . .
Congratulations to our two winners! Official email notifications will go out right away. Please respond within 48 hours to claim your prizes. Remember that I will always reply to let you know that I have received your information.